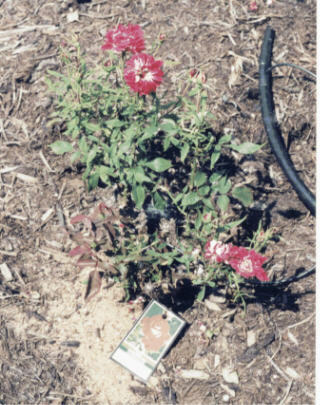 FIRST CONTACT - FALL 1999 Rose rosette disease (RRD) came into my rose garden Thursday, August 26, 1999 and left the way it came three hours later, in a large plastic bag, in a car. 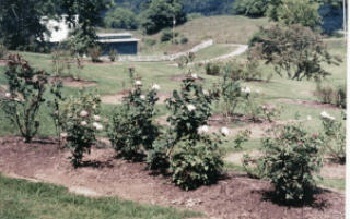 At that time it was thought that we didn't have Rose Rosette Disease in East Tennessee. We had, however, been warned by Dr. Mark Windham, plant pathologist at the University of Tennessee, to expect it. A lady in our rose society was concerned because her Double Delight' was growing long non-blooming canes. She cut off several canes, stuffed them in a plastic bag, and came out to our house for a covered dish/ rose society meeting. In the middle of my rose garden she pulled the canes out and started asking if anyone knew why her roses weren't blooming. Our Consulting Rosarians didn't know what the problem was, nor did any other members. I wandered over, looked, and remembering Marks warning, said "Maybe it's rose rosette and it would be better to put the canes back in the bag". She folded her canes individually into "U" shapes (the canes didn't break or even crack and the thorns were too pliable to injure either of us), slipped them back into the plastic bag, and put them back in her car. That night, fearing the introduction of RRD into my garden, I panicked. I looked up RRD in rose books (found almost nothing) and went on the Internet. The references I found, the pictures, and descriptions worried me. I called and E-mailed around and was reassured by everyone I talked to that we didn't have rose rosette in East Tennessee. I also read that RRD seldom affected cultivated roses. That was the night I started to live with the threat of Rose Rosette. I called her and asked if her rose was ok, it wasn't. She called me back Wednesday, May 17, and said the county agent had confirmed that her rose had RRD. The next evening at a rose society meeting I announced the confirmation of rose rosette and talked about its warning signs. It happened that Dr. Windham was the speaker that night and he said except for RRD on wild 'R. multiflora' in middle Tennessee, he hadn't seen any infected plants to date and he wished someone would bring him one. At the beginning of the meeting a local landscaper offered me three roses he had been shovel pruned from a clients garden. After the meeting, he said, "I don't think you want these roses". He explained that the roses hadn't grown well, but he had not understood why, until I talked about rose rosette. From his background in agriculture, he knew about rosette growths on other plants and felt sure that these three roses had RRD. These roses didn't look like the fall infected canes of 'Double Delight'. There were no new canes, just rosettes of very skinny stunted leaves that were brownish-green by the light of the parking lot. At the same meeting the volunteer curator of the Lincoln Memorial University (LMU) Rose Garden, asked us to come up to the garden in Harrogate TN the next Tuesday to help. 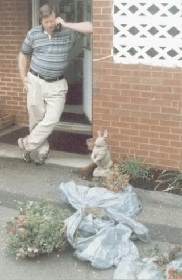 My husband, Larry, and I had helped there the previous summer by installing a drip irrigation system. The rose garden was on a hillside, the summer had been dry and they had lost a lot of roses. On Tuesday May 23, we drove to LMU and arrived while the other volunteers were at lunch. 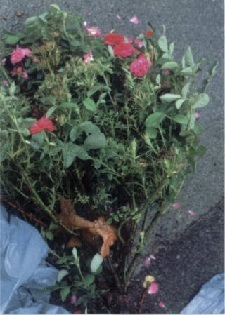 On the ground were dead roses they had pulled out of the ground, preparatory to planting new ones. There were very skinny leaves on some of the dying rosebushes. But what got Larry's attention first were the roses still living...roses with rose rosette. At first I resisted the disease call, and then I saw Rose de Rescht'. The previous summer it had impressed me. While other roses were suffering, plants of Rose de Rescht' were covered with healthy leaves and loaded with blooms in the heat of summer. Several Rose de Rescht' looked as good as last year, but the one in the northern most bed was sick. Some blooms were half normal size but still recognizable as Rose de Rescht' blooms and their color was paler than they should have been. 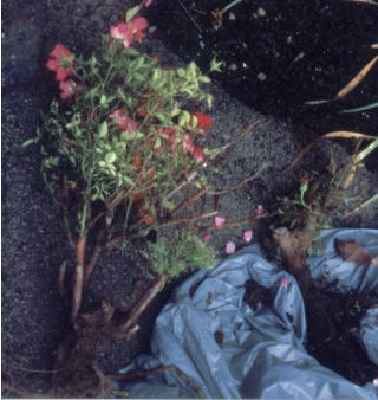 Some buds had elongated sepals, shortened petals, and enlarged receptacles. Other buds had elongated sepals but very few, if any, petals. On other canes there were buds whose stems had grown together. The ghastly reddish purple color of RRD infected foliage was NOT there, nor was hyper-thorniness. Leaf density and internodal distance? Who can tell on a Portland? Some leaves were normal, other stems ended with masses of very short leaves in rosettes. This bush was definitely sick with something (Fig.1& 2). At left, the blooms are half the size of other blooms on healthy bushes of 'Rose de Rescht'. The rosettes of different sizes are not sepals, but rosettes of leaf stipules from leaves that never grew larger (the leaf blades are represented by thin strips of plant). Other leaves at far left have elongated stipules. This bush was rogued out and taken to the UT campus for shipment to Nashville for disease confirmation. From a distance the normal leaves almost hid the aberrant growth. One rose bed featured many Dr. Huey' in bloom. One Dr. Huey' had canes only a foot high and the leaves were very thin . ThoseDr. Huey' blooms appeared to have about twelve petals and to be more pink than red (Fig. 3). The rosebed of Dr. Huey' had been there so long that it had sentimental value to some alumni who look forward to the mass of deep red blooms every spring. No one remembered if it was intentionally planted or represented surviving rootstock. Two potted HT roses I transplanted the previous summer had been healthy with good canes and leaves. I remember the bloom color: red with white reverse. Ten months later, after a mild winter, these two roses looked like minis from a distance. Up close I could see that the canes had been cut back and there was some new growth, but the new growth was sick. Both roses were blooming, if you can call it that. No HT form, only ten petals; no red with white reverse, but mottled pink with no different color on the reverse surface. And the leaves were the skinny green leaves and the new growth was from above the bud union (Fig. 4). There were thorns-not like other thorns on the healthy cane of the HT, but thin sharp prickles, reminiscent of Spinosissimas. Fig. 3 Dr. Huey second year infection with RRD . This may have been the smallest 'Dr. Huey' in Tennessee. Fig. 4 Unidentified HT: first year infection RRD. Larry said sarcastically, "But we don't have rose rosette here" and then seriously "So where did it come from?" I was facing north towards Cumberland Gap. Closer to us were successional fields (formerly used for the dairy and beef cattle that fed the students in harder times). My answer was easy, "The fields are full of 'Rosa multiflora'. Just look at all the white blooms". There they were, masses of white blooms on huge bushes scattered though fields to the edge of the woods. 'R. multiflora' was even along a path skirting the edge of the rose garden, one hundred and sixty feet from the new rose bed that was being planted that day (Fig. 6). As we found more plants that we suspected of having RRD, the volunteers were planting new, grade #1 roses, in the new bed and throughout the garden. Cooling breezes swept down from the Gap, across the fields of 'R.multiflora' towards us all. We told the curator what we suspected and dug up plants to take to Dr. Windham (Fig. 5). We double bagged the roses, and put them in the trunk of our car. The next morning we delivered them, and took some photos. Six days after Dr. Windham asked to see just one plant, we gave him six. When we got home we sprayed the trunk with Cygon 2E (that I had bought as soon as the first rose rosette was confirmed). We washed thoroughly because we had been handling the plants. Fig. 5 Dr. Mark Windham - Plant pathologist at UT receiving "body bags" at his lab on the UT campus. Without his warning and help, we would not have had a clue what hit us. Instead of losing two roses in our garden we could have easily have lost 200 and the many people and rose societies we were able to help would not have been helped. 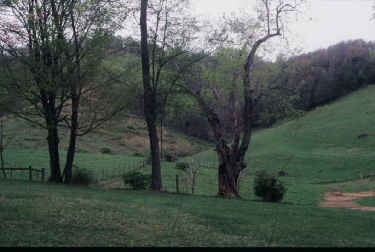 hillside in the background is dotted with R. mutiflora. Friday, May 26, Dr. Windham E-mailed me that rose rosette was confirmed by the lab in Nashville. We called the curator, and May 30 he removed the other infected plants we had tagged. We were now living with rose rosette. Fig. 7 One of many rose beds at the LMU Garden. The bush just right of center front is an infected shrub or floribunda we watched as it died from RRD. See Chapter 11 - for more pictures of roses from this garden. This rose garden no longer exists. This hillside has been regraded and is now only grass except where LMU has rerouted a road. 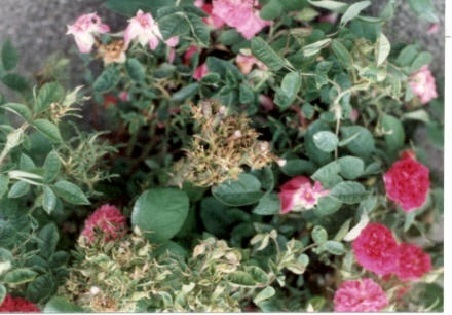 There is still R. multiflora in the field upwind and in 2007 that multiflora is still heavily infected with Rose Rosette.